Beautifully crafted, the Mayura collection by Surya is an art piece of its on calibur that you can snuggle with. 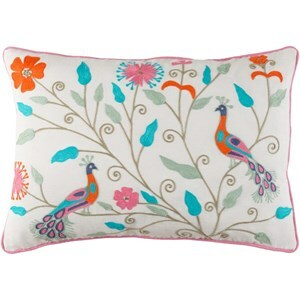 This pillow's face is intricately woven in India and features to colorful peacocks among a floral design. 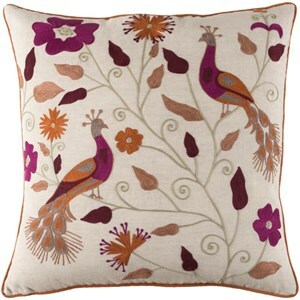 This pillow also features a piped edge that seems to frame the artwork showcased on this lovely addition. Please spot clean and line dry this pillow only to ensure a long life. The Mayura 13 x 19 x 0.25 Pillow Cover by Surya at Hudson's Furniture in the Tampa, St Petersburg, Orlando, Ormond Beach & Sarasota Florida area. Product availability may vary. Contact us for the most current availability on this product. Browse other items in the Mayura collection from Hudson's Furniture in the Tampa, St Petersburg, Orlando, Ormond Beach & Sarasota Florida area.